It’s been about three months since 10:10: Life to the Fullest released. 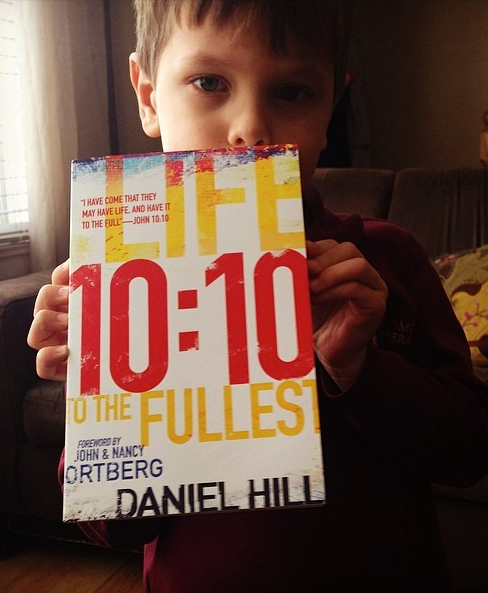 When I first got a copy of the book in May, it was an indescribable feeling (this is my almost 5-year old Xander holding up the first copy). I worked on it for over 10 years, and there is nothing quite like the experience of seeing something that’s lived in your heart for that long transform into something concrete and tangible. When you write a book on faith (and I imagine this is true regardless of the topic), the primary hope is that God will use it to touch someone else’s life. That has definitely been the funnest part so far. I’ve received notes from people across the country who stumbled onto the book in a variety of different ways, and it’s so much fun to hear how the book stirred new thoughts, ideas, and views of God within them. The most recent was a letter from a student at Kansas University who said she was just about to give up on faith. She had been part of a church that had a rigid view of Christianity, and just as she was about to walk away someone gave her a copy of 10:10. She somehow tracked me down to pass on specific sections of the book that re-envisioned the way she understood Jesus, and joyfully shared that she was ready to fully surrender to him. I love it! One of the things that has also been a fun (and new) part of the journey is doing radio interviews. I don’t think I realized how many cities across the country have Christian radio stations, and I’ve been a frequent guest on a variety of talk shows (as an aside – I’m doing my first TV talk show this week! I’ll be sure to post the links once they have aired). Much like the actual process of writing the book, talking on these radio shows has probably been more valuable for me than it has for those interacting with the ideas. There is something about the process of forcing yourself to articulate your own thoughts that inevitably sparks deeper levels of growth. I made the decision early that I would avoid doing anything that felt like a pre-written script when being interviewed, and instead chose to be fully present in real time with my thoughts. This has been great, because it keeps the material fresh for me. I never ask them where they are going with the interview – I like being surprised by whatever their questions are. I’ve been part of over twenty shows now, and each interviewer tends to have a slightly different lens in how they approach the material of 10:10. Some of them really focus exclusively on fear, while others want to spend the whole time on faith and mission. Some want to talk about the reality that so many Christians feel stuck in their faith, and others really want to talk deep theology about developing a holistic view of the kingdom. Each time I finish an interview I write up a short recap of it in my journal. I often feel God stir my own heart during the conversation, and it’s a life practice for me to pay close attention to those moments. It also provides the benefit of allowing me watch my own thoughts on faith continue to evolve. I was looking back over my notes recently, and noticed a trend in the questions. Though each interviewer has their own slant, I noticed that there is one question that has come up more often than any other. The question I get asked more than any other is some variation of this: how does one hear the voice of Jesus? I was surprised the first couple times I got asked this, because it is not a question I directly address in the book. But it makes complete sense when I take a step back. The launching point of 10:10 is Jesus’ teaching in John chapter 10. Here he identifies himself as the Good Shepherd, and he spends a fair bit of time using that metaphor as a way to describe both his character and activity in the world. Sticking with the metaphor, he says that his followers are like sheep under the care of a master shepherd. I think this is a really important question. Jesus invites us to listen and respond to him, but what does it actually look like to hear the voice of Jesus? That’s the question I will do my best to tackle over these next few posts. That was a good, informative post. And congratulations on finishing your book and being published. Much hard work went into the project – and I’m glad God is providing some fruit. Blessings on your book!